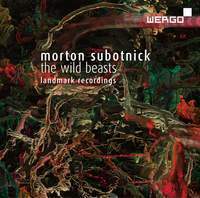 “The Wild Beasts” was originally inspired by an exhibition of Les Fauves paintings, which left the impression on Subotnick that every subject can only be perceived through a strangely prismatic atmosphere, an atmosphere comprised of rare and possibly "unearthly" gasses, an atmosphere in which normal expectations of colour and shape would not exist. For these visual impressions, the composer developed an acoustic counterpart: a traditional musical instrument played into an unusual and continually transforming atmosphere, an atmosphere in which normal sound expectations would no longer exist. “After the Butterfly” is a concerto-like work for trumpet, instrumental ensemble and electronics. The work is one of a series of what Subotnick calls "ghost" pieces. Independent layers of increasing and decreasing intensities of sound material form the basis of the work.